The following is a broad roadmap of what we expect to develop for future content updates. In between these updates there will likely be minor updates, bugfixes and other tweaks. Please note that the development roadmap is subject to change (especially content scheduled further out!) and does not include everything in development for Slime Rancher. Additionally, the updates listed below may be released in multiple stages. Click Here for a List of All Previous Updates! Join Viktor Humphries and test his simulated reality of the Far, Far Range. Well, a work-in-progress version anyway. You see, his work is hitting a wall because of the numerous bugs in the code as well as an unusual phenomenon: glitches that take the form of... slimes? 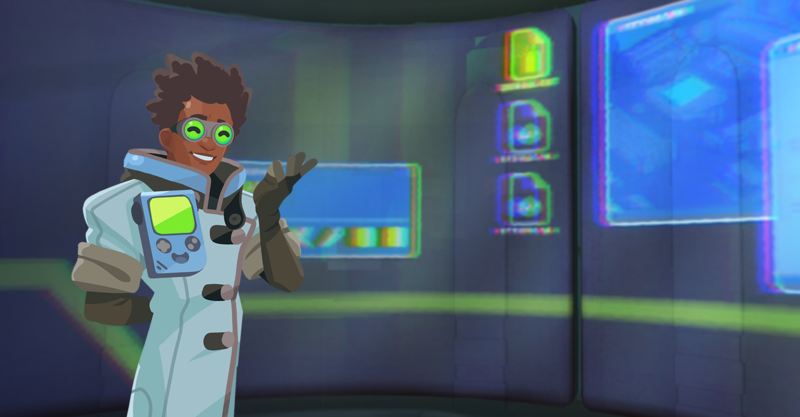 Glitch slimes have been discovered living inside Viktor's Slimeulations and it's up to you to help him capture, quarantine, and research them before they spread! But it won’t be easy! Glitch slimes can be difficult to find as they are often hiding in plain sight, pretending to be regular slimes or real objects that were definitely there before... nothing to see here just a regular tree in its regular spot and not out of place. Use Viktor's patented debug spray to reveal hidden glitch slimes and vac them up before they disappear! 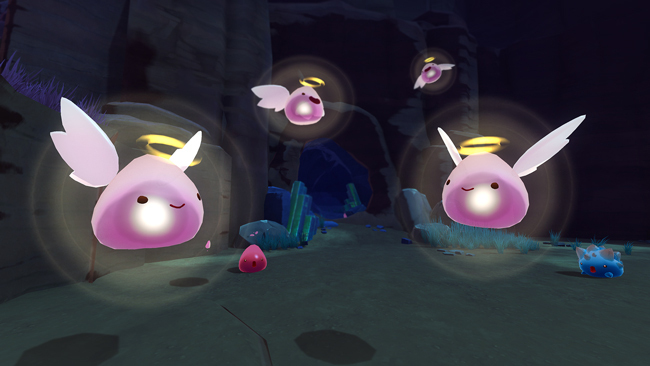 Be extra careful while exploring: taking damage could give those tricky glitch slimes a chance to wiggle out of your tank! The Slimeulation is still full of bugs and will begin to degrade over time. Collect as many glitch slimes as you can before the corruption starts to spread. When the exit portal opens, make a break for it before things get out of control and escape the simulation safely! Glitch slimes will turn into bug reports after you leave the Slimeulation. Turn in your collection of bug reports for some cutting-edge ranch tech designed by Viktor himself. These new-and-improved drones can handle not one, but TWO programs! Talk about advanced! Set a primary AND a secondary task to keep these busy bees busy while you’re busy being breezy. Water taps are a small, placeable water source that can be used to refill your tank if there aren’t ponds nearby. This is an experimental gadget constructed by one of Viktor’s scientific peers and, when it works, it creates a perfect clone of any chicken. When it doesn’t, well, that’s a data point at least! We’re adding a brand new storage device that will be unlocked via the 7Zee Rewards Club as a mid-tier reward. It allows you to store, clean up, and manage decorative ranch items (ornaments, echoes, etc.) with the press of a button! Viktor's Experimental Update is shaping up to be a pretty big update and there's even more packed into it that we will be revealing soon! We’re packing a lot into v1.4.0 and we expect it to be ready this summer. Thanks for your patience! We’re developing some paid cosmetic DLC that will allow you to reskin every slime into an awesome, exotic form! Current designs include angelic phosphor slimes, tiger tabbies, and lilly pad puddle slimes. It even applies to largo forms! We decided to do this DLC after reaching out to the community and discovering many of you would be interested in supporting us beyond the base game. This DLC is totally optional, and purely cosmetic, so if it’s not a fit for you, we’ll still have plenty of other surprises down the road. Release date for this DLC is still TBA. We’ll keep you posted!